The Franciscan Friars (OFM) where founded by Saint Francis of Assisi in 1209. The Australian Province of the Holy Spirit has its origins back to the arrival of the first Europeans. Individual Irish friar priests came to Australia to serve Catholics in a a number of early settlements. In 1879 the Friars were given an area in eastern Sydney to establish a Franciscan Mission. They key areas of that mission were Paddington, Edgecliff and the Waverley Parishes, but the area from which we were originally responsible stretched from Watson’s Bay down to the edge of Botany Bay. The Franciscan Friars have had a long tradition within Australian Catholic parishes, ever since Fr Bonaventure Geoghegan was installed in 1838 as the first – and only -parish priest for Melbourne. In reality, his district covered all of Victoria. 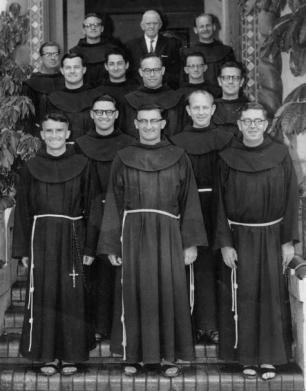 Our engagement with Sydney and Melbourne grew and In 1939 the Australian Franciscans were established as a Province. We spread across Australia and into New Zealand and Asia over the many decades of our life together: to Box Hill in Melbourne (1936); to Campbelltown (1934); parishes in Adelaide, our friary and parish in Brisbane (1929) and Padua College in Brisbane (1956); to various parishes in Western Australia (beginning in 1950); to New Zealand in 1939 and the establishment of a retreat centre. We began our work in Singapore in 1958 establishing St Anthony Friary in 1970 with a move into Malaysia in 1999. Throughout our history as Franciscans and as a province (Australia, New Zealand) and a custody (Singapore), we have always endeavoured to listen to the signs of the times (Gaudium et Spes n.1) and to respond with generosity to the call to reach out to those in need.